6. Scepticisms: Notes on Contemporary Poetry. New York: Knopf, 1919. Reprint, Freeport, N.Y.: Books for Libraries, 1970. 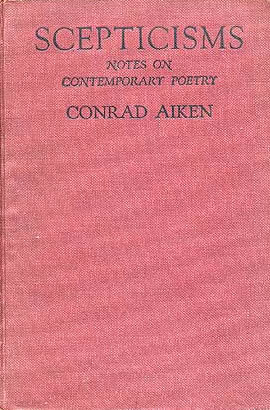 Aiken wrote extensively on contemporary poetry for the major literary journals on both sides of the Atlantic. This work collects thirty of his reviews, including ‘The Return of Romanticism’ (4), ‘Sunt Rerum Lacrymae’ (5), and others that set forth misgivings about Imagism and especially the contributions offered it by Amy Lowell.